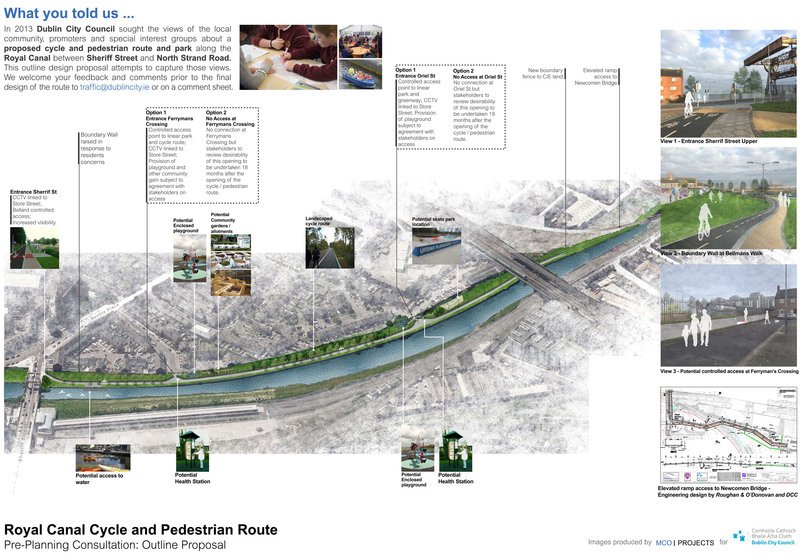 Dublin City Council has released a pre-planning consultation visualisation of a section of the Royal Canal Walking and cycling route between Sheriff St Upper and North Strand. The route will partly act as an alternative to a now scrapped link between the S2S Dublin Bay route and the Canals Route which Dublin City councillors rejected — along with €4 million funding — in 2011 after “intensive lobbying”. That scrapped €4 section would have linked the Grand and Royal canal cycle routes with the existing northern section of the S2S Dublin Bay route which starts between the Fairview Park and the Eastpoint Business Park. The new alternative will include the Sheriff St Upper to North Strand (shown in green below) link and a segregated route on-street via Fairview. 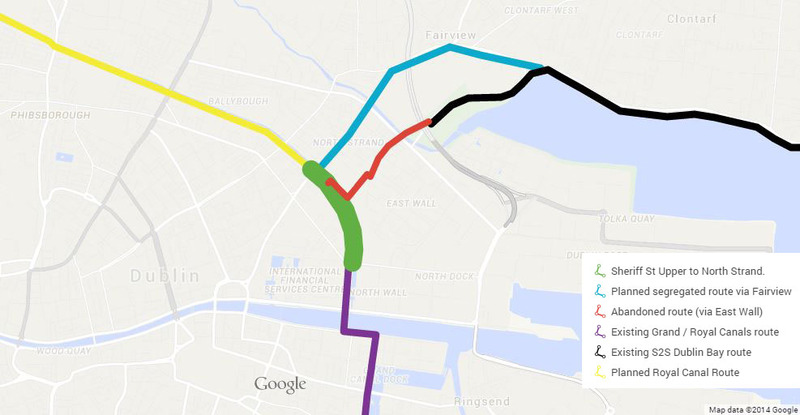 The route will start in the North Docklands as a continuation of a small section of the Royal Canal route, started as part of the existing Canals Routes (purple) from Rathmines to the North Docklands. At its northern end the Sheriff St Upper to North Strand route is planned to be continued along the Royal Canal (yellow) eventually to Athlone and onto Galway. A segregated on-road path planned along North Strand Road and Fairview with link to the northern section of S2S Dublin Bay cycle route (black). The outline proposals (as above or below in PDF) were also due to go on display at the Charleville Mall Library; the East Wall Community Centre;Dublin City Council Central Area HQ at 51-53 Sean Mac Dermott St; St Laurence O’Toole Sport and Recreation Centre on Sherriff St; and Faye’s Shop at Seville Place. Its a start but it makes sense to create a bike path ftom Mannooth to Dublin , the path and the canal are already there! – The proposals will turn a derelict fenced-off wasteland into a extremely useful and potentially beautiful linear park and cycle route, contributing enormously to the local and civic communities. – The North Strand cycling commuter route is the busiest in the city. Having an off-road route from northern suburbs to Dublin 2 or 4, as well as the major employment area of Docklands, will be extremely welcome to cyclists. If this route can be made to be through a pleasant canal-side park, the experience for cyclists would be wonderful. – Following on from that improvement in quality, a significant boost to modal shift from private car use and DART is very likely. – The design of the access to North Strand Road Bridge has been difficult and the solution presented here, while not perfect, appears quite workable and adequate. It is significantly improved on the previous Roughan O’Donovan scheme linking to Ossory Road, regarding which we also made a submission. Additional space for manoeuvering and crossing the road would be welcome at the junction with North Strand Road Bridge. – Passive observation from the houses on Canon Lillis Avenue, Ferrymans Crossing and Oriel Street Lower will be critical in making a safe-feeling space and reducing anti-social behaviour. – Where anti-social behaviour is anticipated, research has shown that, at night, raising light levels to higher than those in surrounding areas can help to discourage it. CCTV is also needed right along the route. – The possibility/safety/potential dangers of children swimming in the area needs to be considered. Summer swimming in the Liffey is extremely popular. – Locating a skate park and playground on the park is commendable; these will give the space vitality and be of good service to residents. – These proposals should be supported and commended. – Details should be carefully worked out to ensure safe and easy use by both locals and commuters.